The report, which is part of the IoT Analytics Smart Cities series, was compiled over the course of 6 months and is a holistic overview that analyzes a range of smart parking product and service offerings, presents detailed findings in 35+ analysis charts and 20+ market data tables, highlights 10 case studies and vendor profiles, outlines 9 business models, and describes 7 trending topics and challenges. It serves as a strategic guideline and strong foundation for any company, organization, or city aiming to make sense of what is happening in the smart parking sector today and in the coming 5 years. Smart parking technology enables parking operators to remotely and automatically monitor parking occupancy rate on a real-time basis. There are various levels of smart parking solutions that make up a complete end-to-end smart parking solution such as deployments comprising of vehicle detection sensors and cameras with automated vehicle license plate recognition technology, smart parking meters, smart payment for parking, and parking assistance by digital signage and navigation apps. However, the real innovation of smart parking solutions is beyond the obvious. The real value lies in the parking data generated, that when combined with other stakeholders’ (e.g., merchants, city agencies, delivery firms) data, processes and systems yields real innovation in smart city settings. Understanding driver patterns and behavior can help city planners optimize the flow of traffic and reduce congestion. For example, adapting parking fees accordingly can promote or discourage motorists from certain areas (e.g. city center) at peak times (e.g. Christmas). Market spending for smart parking products and services is expected to grow at a CAGR of 14% and surpass $3.8B by 2023. These numbers are based on growing smart parking adoption across all regions and the analysis of distinct technological subsets of the smart parking market: the sensors, smart meters, digital signage, navigation and smart payment platforms. The penetration rate of “smart” parking spaces in the public domain (on-street and off-street) reached 11% in 2018 and is expected to reach 16% by 2023. 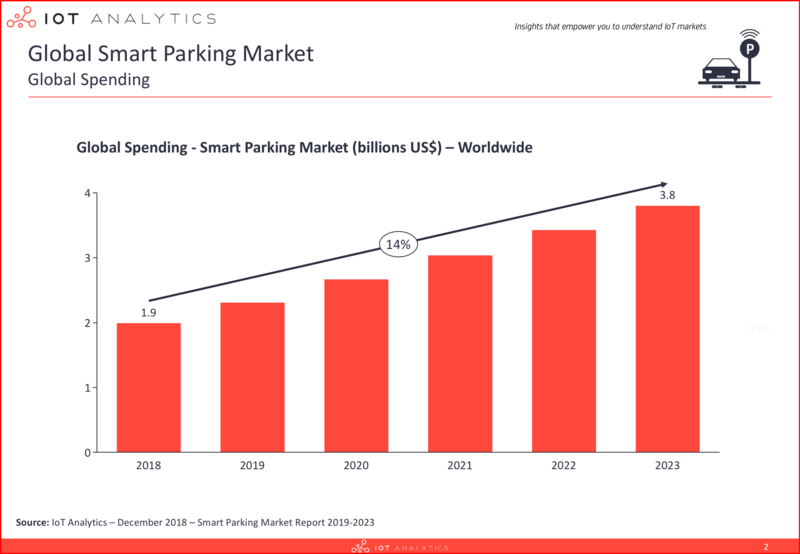 The smart parking market is further broken down into detailed data on installed base, shipment, and spending across 4 regions; North America, Europe, APAC, and Rest of World. A competitive landscape introduces the leading vendors globally and highlights the regional differences in the market. The report includes a list of 90+ real-world smart parking implementations and has a detailed deep-dive on 10 specific case studies from cities around the world. A technology segmentation and key drivers of adoption are outlined in the report which also discusses 7 trending topics and challenges in detail. In developing the 116-page report, the analyst team studied over 50 companies that offer smart parking products and services and attended several leading industry conferences. Further insights for the report were gleaned from interviews of 20+ experts covering a variety of smart parking technologies and deployments. Amano McGann, China Telecom, CivicSmart, Conduent, Chordant, Cleverciti, Flowbird, Huawei, IPS Group, Itron, Kerlink, Libelium, Nokia, Nwave, ParkMobile, Parkopedia, Sigfox, Telensa, World Sensing, among others. The post 11% of global public parking spaces are now “smart” – New report finds appeared first on IoT Analytics.